Six Polish organizations of the peace and social movements as well as the international network No to War – No to NATO conducted a NATO Alternative Summit “No to War – No to Militarism – Yes to Refugees” in Warsaw on Friday July 8th. The aim of the conference was to continue the delegitimization of the largest military alliance of the world which permanently and globally is involved in wars. About 150 persons from 18 countries discussed at the unexpectedly large counter summit. Among others participants came from Russia, USA, Czech Republic, Ukraine, Poland, France, Germany, GB, Belgium and Spain. They discussed the actual wars and conflicts, the creation of peace, social justice and common security in Europa. Worrisome are the actual dangers of increasing militarism in Eastern Europe, particularly because of the troop movements, aggressive maneuvers and the missile defense shield of NATO. Scenarios right up to a “great war in Europe” cannot be precluded anymore. Therefore the participants agreed that the international peace movement faces the largest challenge of recent years. The NATO induced confrontation with Russia, the global projects of armament like missile defense and the modernization of nuclear weapons need to be stopped in order to give a process of cooperation in Europe a chance. The deployments of NATO’s military structures to the Western boarder of Russia as well as the Russian reactions bear the danger of an intended or accidental war. A common and cooperative system of security which orientates along the needs of people is the alternative. 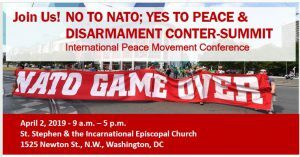 “Intensified international networking of the peace and social movements is necessary”, states Kristine Karch, Co-Chair of the international network No to War – No to NATO. She continues: “the impressive meeting in Warsaw was an important step in the necessary connection to the Eastern European and Russian movements”. “Even in such a NATO-loving country as Poland we could successfully delegitimize NATO. We presented many facts from many different countries and clearly stated that the dinosaur NATO does not have a future”, stated Lucas Wirl, Co-Chair of the international network No to War – No to NATO. 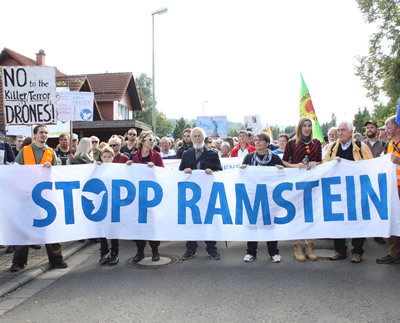 The actions will continue on Saturday with a demonstration and on Sunday with a strategy meeting of the international peace movement.